Monday Meltdown- The best Pizza, in the World, FACT! According to my 6 year old, we make the best pizza ever, FACT! I am not going to argue with the boy, it's pretty good! I make the dough and tomato sauce in advance and simply chop the toppings and arrange them on either a large plate or little bowls. 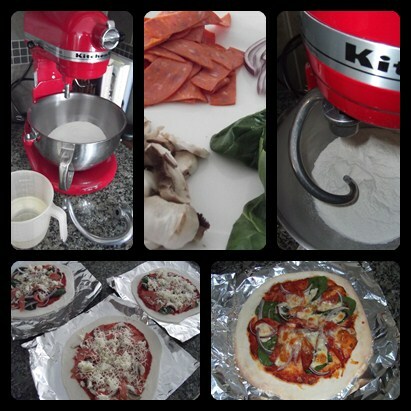 After the dough is rolled, let your kids pizza imagination run wild! I don't own a fancy pizza stone and simply use tin foil rubbed with a little oil. Using tin foil, my bases are crispy and perfect- nothing worse than a soggy bottom! I use this basic bread recipe for pizza dough and basic white bread- it's quick, easy and fab! Place all the ingredients in the bowl of a freestanding mixer and attach the dough hook. For those who do not own one of these- get one please, they are lovely! You can also mix by hand- place the dry stuff in a bowl and make a well in the centre, add the wet and mix. Tip onto a floured surface and knead for about 10 minutes, until the dough springs back under a floured finger pressed into it. For the mixer, add the combined wet and dry to the bowl and set the mixer on the lowest setting it will do. I mix for about 5 minutes and test the dough with a floured finger as described above. Once your springy dough is ready, cover with a tea towel and leave in a warm place until doubled in size (about an hour, but if you don't have the time I have not risen the dough and my pizza's turned out flat but still lovely). Knock back the dough and roll as needed, using lots of flour! Oh and my kids love putting flour on their hands and clapping them together! Makes a mess, but it's good fun! Toppings are up to you! But if you want your kids to put spinach on their pizza's (I love spinach on pizza), tell them it will make their muscles grow like Popeye and they add it like crazy people! Cook on a high heat 190/400 until melted, bubbly and browned on the crust- 5-6 Min's approx. They are better than any takeaway! Remember, best pizza ever: FACT! I agree amazing pizza base and so easy!